BOSTON – When Chris Lohring was first deciding to build a brand entirely around session beer, some people told him he was crazy. Sure, creating an entire beer line that is less than 5.0% ABV might seem to limit what you can provide to customers, but Lohring thinks just the opposite. “When I first started brewing back in the ‘stone age’, what all craft beers talked about was providing more options than Bud, Miller and Coors,” he said. Lohring is hoping that by offering drinkers a flavorful, low ABV beer, he can begin to bring ‘session beers,’ back into the equation. 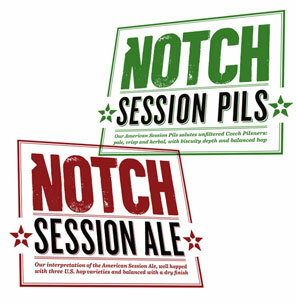 Notch will begin by offering two styles of beer, an Ale and a Lager. Lohring categorizes the ‘Session Ale’ as a great tasting, low ABV beer done in the American Pale Ale Style. His lager, or as he calls the ‘Session Pilsner,’ was inspired by his trips to the Czech Republic, where having multiple beers in a single ‘session’ is expected. Notch beers will only be available initially on draft and in bottles only in the Boston area and Eastern Massachusetts areas. Lohring was kind enough to sit down brewbound for a video interview, which can be seen below.